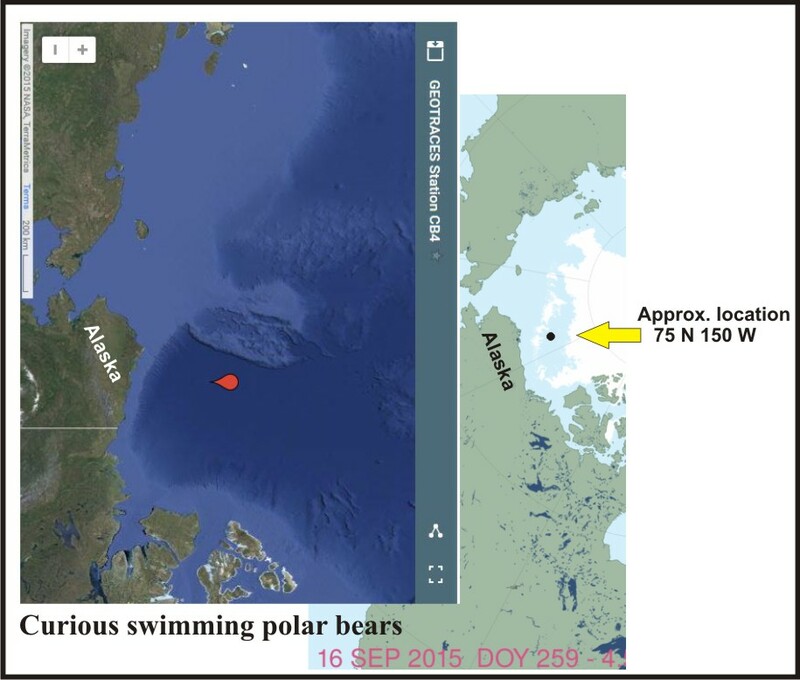 Recent accounts of an encounter with a curious polar bear female and her two older cubs in the Beaufort Sea on 16 September give contradictory details about the position of sea ice at the time. The same researcher told one reporter that the ship was 240 km from land, another that it was 240 km from the sea ice, and in another account (that he wrote himself), said the ship had been far from land and sea ice. But the maps below show that at the time of the incident (taken from the expedition web site) and the NSIDC Masie sea ice map for 16 September 2015, the ship [the CCGS Amundsen, acting as a research vessel] was actually quite close to an isolated large patch of sea ice, although further from the edge of the main pack. A patch of sea ice plenty big enough for a polar bear to rest upon – no wonder the bears did not appear stressed. And the polar bear biologist Cullen consulted (Dr. Andrew Derocher) implied by his response that the bear was indeed far from sea ice. Reminds me of the swimming polar bear off the Hibernia oil platform off Newfoundland March 2015, which turned out to be not far from ice at all. See what you think. “Researchers believe that the polar bears were just curious. “They really weren’t distressed,” Cullen said of the mother and two cubs. Cullen said some viewers have been concerned for the well-being of the polar bears, but experts he spoke to say the bears looked healthy. 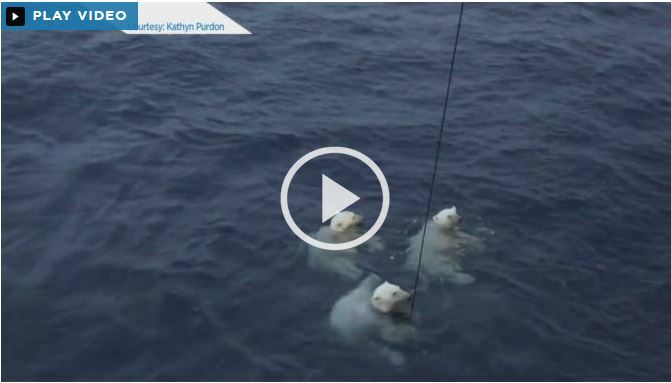 “Cullen said he was surprised to see the bears swimming so far from any land, about 240 kilometres, but after speaking with Dr. Andrew Derocher at the University of Alberta he learned it is not uncommon for polar bears to go on long swims. “Of course the concern is that, as the sea ice melts, those swims get longer,” said Cullen. In a similar kind of story a few weeks ago, a UK chemist insisted that “Polar bears are hungriest when scientists are busiest” which sounded good but isn’t actually true. This entry was posted in Life History, Sea ice habitat and tagged Amundsen, Beaufort Sea, body condition, curious, Derocher, Jay Cullen, open water, polar bear, sea ice, swimming. Bookmark the permalink.